Regiment/Catrawd: Royal Field Artillery, "C" Bty. 95th Bde. Ref No Grave or Memorial / Rhif cyfeirnod bedd: X. D. 16. Died 15th October 1917, aged 20. George Henry Harley was the eldest of six children. His parents George Harley Sr and Mary Ann Williams, were married in Hope Church on 27th February 1897. Mary was a dressmaker, the only child of Samuel and Ellen Williams of Bramley Lane. George Sr was the youngest child of a farmer. In 1881 they lived in Blackbrook Cottage in Llwynegrin, Mold (close to the present day Theatr Clwyd) but by 1891 they were living in Vownog Hill, Penyffordd. George Jr was born in Kinnerton between July and September 1897, and baptised in Dodleston on 14th November 1897. In 1901 the census shows George (a railway plate-layer) and Mary living with George Jr and Samuel in Stryt Issa. In 1911 the census shows George Sr and Mary Ann living in a 2 room property in Bramley Lane, Kinnerton with their 3 youngest children – Eleanor, William and Sydney. George Jr and Samuel were living with their maternal grandparents, Samuel and Ellen Williams, in a 4 room property also in Bramley Lane. Samuel Williams was a railway plate-layer. George Harley’s grave on the 100th anniversary of his death. Many thanks to George’s nephew, and great nephew Martin Harly, for these photographs. George Harley was entitled to the Victory medal, also called the Inter Allied Victory Medal. This medal was awarded to all who received the 1914 Star or 1914-15 Star and, with certain exceptions, to those who received the British War Medal. It was never awarded alone. These three medals were sometimes irreverently referred to as Pip, Squeak and Wilfred. Eligibility for this award consisted of having been mobilised, fighting, having served in any of the theatres of operations, or at sea, between midnight 4th/5th August, 1914, and midnight, 11th/12th November, 1918. Women who served in any of the various military organisations in a theatre ofoperations were also eligible. 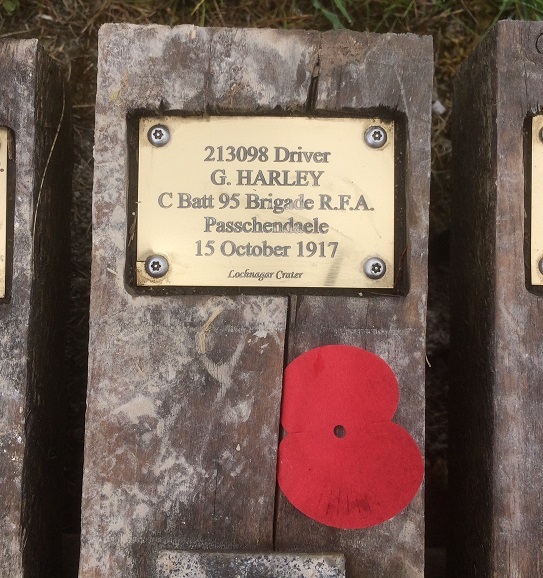 George Harley was entitled to the British War Medal for service in World War One. This British Empire campaign medal was issued for services between 5th August 1914 and 11th November 1918. George Sr, who was still living in Bramley Lane, married again on 10th September 1917 in Hope Church – just a month before George Jr died at Passchendaele. His bride was Martha Ithell a 38 year old spinster who came from a family of market gardeners in The Dale, a short distance from Bramley Lane. In 1901 she had been a servant at Crompton Hall in Higher Kinnerton in 1901. In 1911 she had been a domestic servant in Helsby for Sydney Goffin, who was a civil servant with the War Office’s Local Audit Staff. George Sr and Martha had one child (another George) born at the end of 1918. Sadly his birth, his death and the death of his mother are all recorded in the same quarter. 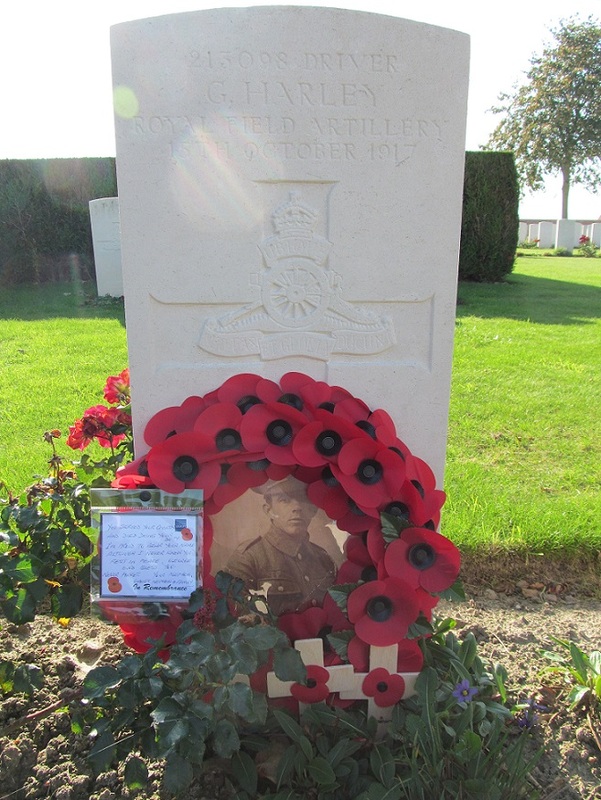 Martha’s youngest brother Thomas had died in the war at about the same time – on 22 October 1918.